Using extra parts from old bikes and a bit of ebay, I did the following to improve the look of my Lime: removed rubber colorways (too iMac 1998 looking), added CETMA rack front and generic rack in the back, made custom slats for both racks using 1/8″ mahogany plywood which I clear coated, added a flask and holder, threw crank bros 50/50 pedals on, swapped out stock seat and post for an old carbon post and Brooks B17 saddle, threw on Nitto moustache bars with matching Brooks tape, and took off the stock 2 inch wide tires for 1.4 inch Ritchey slicks. I’ve enjoyed my Trek Lime since I bought it last summer (I reviewed it for the NYT), but I wasn’t always happy with the look of it. After I attended the North American Handmade Bike Show in Portland (my photos), I considered building up a fixie or creating a frankenbike using an old track frame and bits of the Trek Lime to get gears and braking without any cable clutter. I’ve always loved the clean look of a fixie without its cables, brakes, or shifters, but I didn’t want to lose the utility/easy riding of having gears and a brake. I loved the city bike designs (like this one) from the bike show: nice useful racks, tasteful materials and details, and overall easy to ride bikes. So I rummaged through my garage, bought some parts on eBay and starting dismantling and re-assembling my Trek Lime into something better. I’m happy with the results, it still rides easy, the bars are very comfortable, I can toss tons of stuff on the front and rear racks, and it has the clean cable-free look I was after. I recently bought a Trek SOHO 4.0 with an Alfine internal gear hub. Part of its appeal to me was the clean look, internally routed cabling, etc. 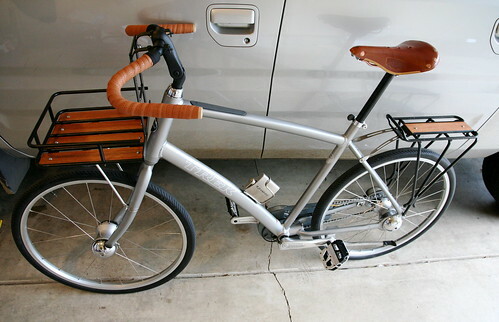 I’d contemplated some similar mods but have never seen the CETMA look so elegant, nor a rear rack so nicely modified. Plus I’m on my third fairly cheap saddle without attaining happiness. I’d resisted the temptation to buy a Brooks but after seeing the incredible elegance of the brown/mahogany wood on a grey bike, I’m screwed. Did you have to bend the mounting bracket in the Cetma? How did you mount the slats to the Cetma? Great mod, Matt. I have new found respect for the Lime. Are you still enjoying the coaster brake? I think that would drive me crazy, as I’m used to spinning the cranks backward often. I didn’t get the fence, though (well, I ended up buying secondhand locally). I don’t think I’d have got it even if I bought straight from Lane, because I’d end up riding fenceless 75% of the time and I’d worry about the holes in the rain. I do need to find something better than PET-fabric grocery bags for grocery runs, though, they flop all over the place. You should send Lane this picture. I bet he’d love to put it up in his gallery. I bet you’ll still want a fixie, just for its own sake. My own plan (flawed as it may be, we shall see) is to get better in the bike shop over the summer and end up with a flip-flop wheel at the end of a wheelbuilding course, which will then be my excuse for assembling the rest of the bike. Wow, beautiful work. Those mahogany slats are genius. That giant looks great. My wife has an amsterdam 3 speed and it’s cool looking but not super functional since it only has three gears and drum brakes. I bet the giant would perform pretty well for commuting. wow, I officially retract my previous Trek Lime Playah Hatin’, cause like “wow!” I’m sending this puppy onto my Trek contacts. this is usually where i tell you to do a backyard or a stick-b on the bike. wow, it’s beautiful! where can i get a front rack like that? Yeah, I definitely looked at Honjo fenders, but they look pretty expensive and finicky on the install, so I never went ahead and got them. Just noticed this post while getting caught up on some feed reading. Really nice work Matt. Love the browns of the seat, handlebar tape and wood slats. 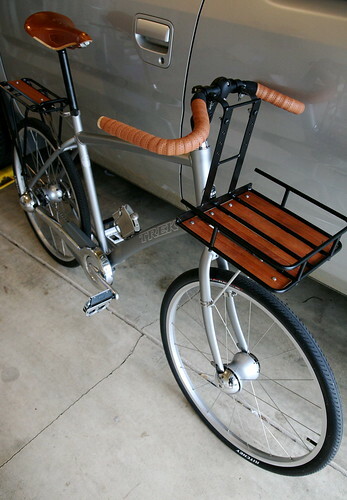 Looks like a great (and classy) errand bike. Just out of curiosity have you considered adding some Hondo fenders from Velo Orange? As a PNWer that’s about the only thing I would want to add (along with a couple leather mudflaps to further tie them into the design). I’m definitely going to have to file CETMAracks away for future bike building projects. Wow, that’s the best looking bike I’ve seen in a long time. Nice work! you really did a great job. I have an old mtn bike i’ve set up with both racks, which i use as my hauler bike to carry stuff. then i have a singlespeed converted to a coaster break setup which is all about the clean look. i didn’t want fixed gear so i opted for a coaster brake. overall it is great and very clean looking, but the back wheel, because it is 700c , tends to lock up fast. so i may put the front brake back on for extra safety/stopping power. good job. cetma rack looks very strong.